I promised this post a long time ago (and have had the photos in my phone for a million years) but with the holidays, it just seemed to never make the docket. But today is the day. 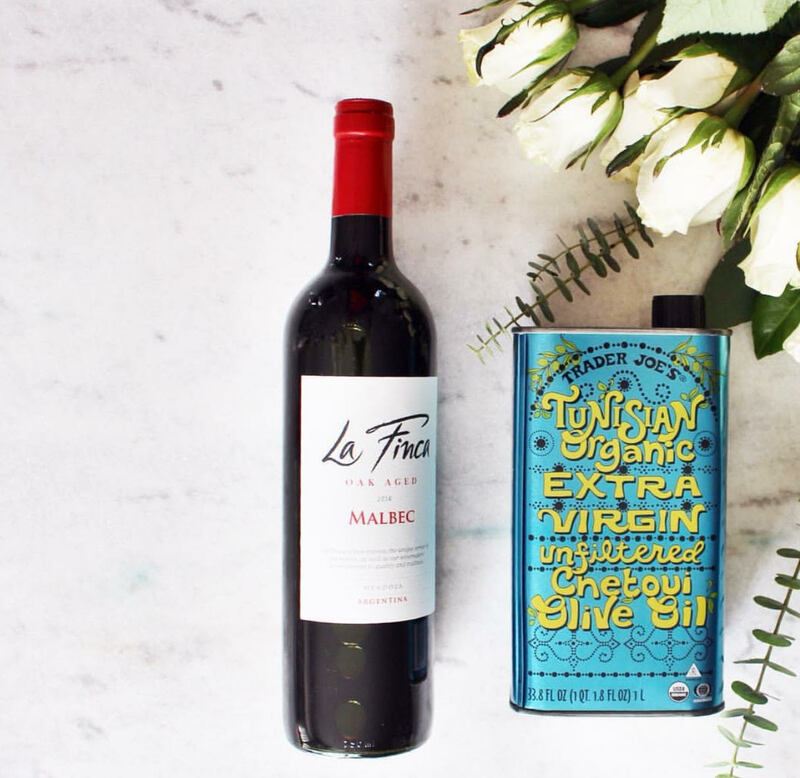 I'm spilling the beans on my all time favorite Trader Joe's products and what type of items I no longer purchase (and why - hint: it's gross). If you follow me on Instagram, you knew this was coming (and you won't be shocked by #2 either). I love the Trader Joe's floral section because the price simply can't be beat. I usually grab longer lasting flowers like hydrangeas, roses and tulips. I actually never pick up a pre-made bouquet because I think you get more bang for your buck if you spend the same amount on two or three bundles and build your own bouquet. Honorable Mention: the mini orchids make great gifts for teachers, friends, bosses, hostesses and the holiday boxwood wreaths (for $9.99!) are unreal. Duh. I made a collage of the ones I pick up most often. I really, really struggle to buy wine anywhere else when I know I can have an entire bottle for $3.99 from Trader Joe's. There is no better cheese section than Trader Joe's. 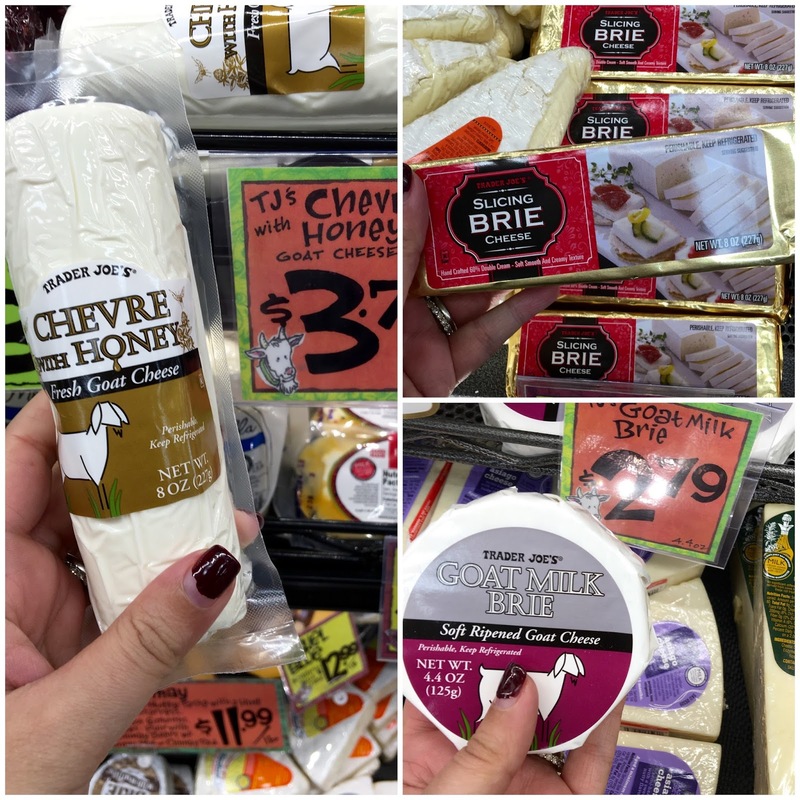 If you are hosting a get together or party (that isn't big enough to require a Costco run, who btw has an awesome cheese selection) I can't say enough about the TJ cheese selection. I grab at least one goat cheese on every trip and the slicing brie is the best thing ever invented (put it on a turkey sandwich with sliced green apples. yes, please). I keep a huge variety of the frozen fruit bags in my freezer at all times to make smoothies for the baby. Pineapple, the cherry blend, mixed berries and strawberries are a must. I add spinach, water and yogurt and know he's getting at least some nutrition to cancel out all of those chicken nuggets. These are perfect for a toddler. I microwave them for lunches or add them to the gnocchi (#9 below) for dinner time. This may be my all time favorite TJ find. It is heaven on grilled asparagus, roasted carrots or smothered all over my all time favorite recipe, Bruschetta Chicken. Another toddler mom win. Breakfast is served in the right portions and with no prep work because this toddler mom is not a morning person - a tip I learned from Britt will help in the morning shuffle - dust with powdered sugar instead of syrup to skip the sticky clean up. This is an absolute must in my house. We keep it in our freezer at all times because there is no easier, faster, more delicious week night meal. It's the perfect serving size for two adults (or two adults and a toddler) and if I want to beef it up a bit I'll add the turkey meatballs or serve with grilled chicken breast. The other night I cooked a few basil chicken sausages that I had in my freezer, chopped them up and tossed them into the gnocchi and got the thumbs up from Justin. Side note: he adds parm to his, I add feta to mine! Another permanent option in my freezer - to beef this one up I'll grab frozen shrimp, sear them in olive oil and garlic and them toss into the pan of risotto as it's finishing up. Obv, you can add chicken to this or it makes an amazing side to pork tenderloin. Nothing is easier than these frozen bags of rice. Enough to serve two, cooks in three minutes in the microwave and the texture is awesome. We prefer the brown and jasmine but they are all good! Holy Hannah do I love this corn salsa. The first time I had it I managed to eat like the entire jar. At a friend's house. So classy. It's a tomato-less salsa that is sweet and spicy and makes a killer dip, too! And P.S. I like the corn chip dippers better than Frito's. This is the perfect dinner for nights when Justin has to work late. I warm this up for him and he loves it - a perfect man meal that isn't super time intensive, especially when he never knows when he might be able to sneak out of the office so I have little warning to prep. This is a seasonal item for Fall but I buy two or three bottles when they hit the shelves. It smells like perfection when heating on the stove and mixes perfectly with winter rum for a spiked cider. I've made the Paula Dean Cheese Straws from scratch many times but I probably never will again because these cheese straws are so good. Trust me on this one, I'm southern, I know what I'm talking about when it comes to Cheese Straws. Honorable Mention: the pita crackers in the pic - I love the regular and wheat! 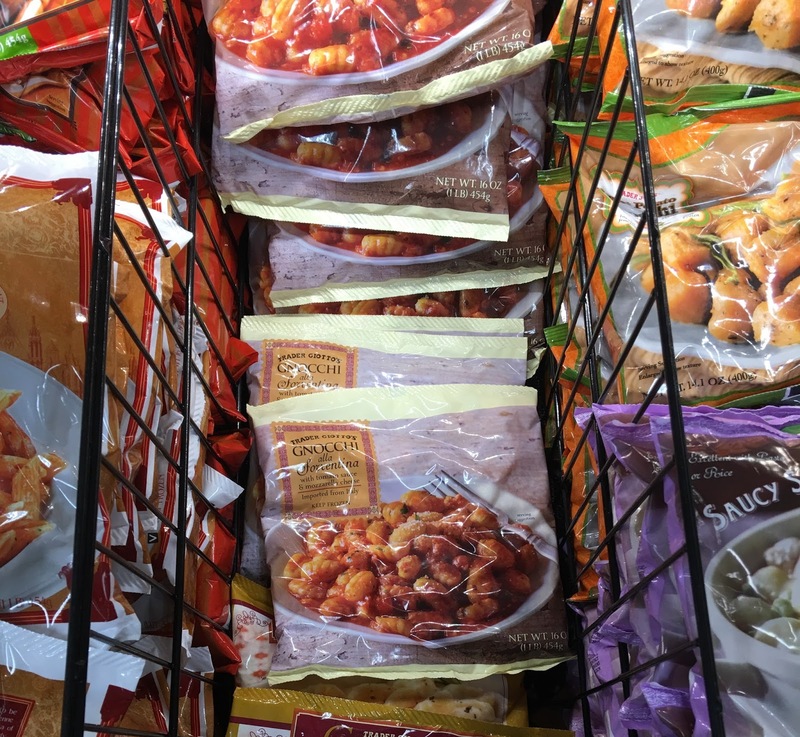 We love a ton of the Chinese food style frozen meals but we always come back to the Mandarin Orange Chicken! Seriously, dinner is ready in minutes when you microwave a bag or two of the frozen brown rice and pour a glass of wine. I've tried many, many times to give Trader Joe's a chance when it comes to produce, but time after time I am disappointing or plain grossed out by rotten apples, moldy grapes or soggy spinach. I once turned over a bag of green apples in the store and saw that they were so moldy and rotten that there was brown liquid all over the inside of the bag. Not a good look. I will say that Trader Joes has an amazing return policy (even if you simply don't like something you can return it - and they'll let you open and sample anything in the store before you buy), but who has time to drive back to the store to show off moldy grapes? It's easier to just steer clear and grab produce at the grocery store when I head there to stock up on paper towels, detergents and cleaning products. After narrowing down this list, I could probably do a second post of seasonal faves but I'll spare you and save it for another day! Any Trader Joe's items that I must try?? Great list! I just went yesterday and these are some things i'll try next time... here's my list of must-haves: try the Turkey Chili with beans, the dark chocolate wedges with Caramel, the Reduced Guilt Brownie Mix, Japanese Style fried rice with Edamame, Tofu & Hijiki Seaweed, and the fruit and vegetable wash. The Spicy Chai is good, too! The frozen croissants, rosemary raisin crisp crackers, frozen monzerella sticks, and refrigerated crescent rolls are big hits at our house. As for produce the only stuff I like at TJ's are bags of lemons and avocados and colored peppers. The prices are much better than at the regular grocery store and they have a long shelf life! I am always so envious of people's flower purchases! I want to buy flowers there but I'm worried that customs will give me a hard time bringing them across the border. Also, what are cheese straws?? Sounds delicious! Slicing brie?!?! You may have just made my year with that. How have I never seen this before?? I'm off to go find some! Also love that balsamic glaze! And their wine selection! Okay, my favorite TJ's trick is to buy a box of their ready-to-serve lentils, a tub of bruschetta, and either crumbled Feta or crumbled goat cheese. Mix it all together, and you have: (1) a great appetizer for a party (serve with the corn chip dippers!! ); (2) a perfect filler for a tortilla wrap; and/or (3) an easy and healthy side dish for a baby's meal OR a grown-up's meal! Honestly, sometimes I just eat a ton of it with some Ritz crackers and call it dinner! My town is really trying to get trader joes to come! A grocery store just left an empty location so I'd love it if it happened. Then I'll be coming back for all you suggestions! I am picking up that glaze on my next visit! My ultimate favorite TJ's item: the pollo asada. Perfect for quick fajitas. Honorable mentions: tart cherry juice (helps with sleep), pizza dough, & Mochi! I also love their orange chicken and constantly have it in the freezer. Will have to try some of your other frozen picks next time! I love the Green Fin rosé, you must try! We also just discovered their tomato basil hummus, which is amazing, especially with their 12 grain mini crackers. The pork or green chili chicken tamales are also good and another easy dinner when you add some black beans! I was waiting for that orange chicken. It's Mark's favorite, and I always have a convo with the cashier about it when I check out with four bags of it to stockpile the freezer. 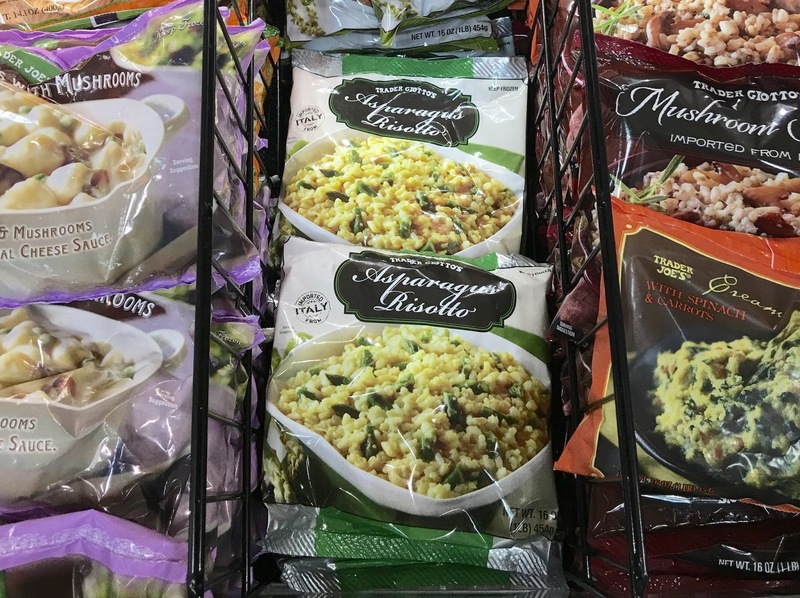 We had it for dinner last night with the easiest, best microwave rice ever. Trader Joes is as fancy as my cooking gets, and I love it. Pumpkin bread didn't make the cut? It's my favorite seasonal item they make, hands down. Add chocolate chips and perfection is on your plate. OMG I just discovered Trader Joe's flower purchase! The flowers I have from almost two weeks are still going strong. And you can't beat the price too. Also love their turkey meatballs. Need to try those meatballs for the kids! A few of our favorites: veggie fried rice, BBQ chicken pizza, sweet potato frites, frozen tamales (top them with the bottled enchilada sauce and cheese - yum!) and thai shrimp dumplings w/ their bottled gyoza sauce. And the flowers are the best part, of course! Ahh I soo wish there was a Trader Joe's near me! They always have amazing frozen food. I think I remember really liking their coffee, and I know we always used to pick up cookies there. This sounds funny, but I particularly remember their Chocolate Chip Dipper cookies! I don't even think I used to dip them in milk, I'd just eat them straight out of the container. The flowers look gorgeous. I didn't know that about the produce. Usually if it's moldy once or twice, I let it go, but for you to have that many bad experiences - ugh! I know not to shop there for produce if I'm near one. I catered a cocktail party for 40 people for $100 including booze with TJs. I actually also including a version of Cathy's suggestion of mixing ready-to-serve lentils with bruscetta on top of small toasts. BIG cheese board including Delice de Bourgogne cheese and creamy toscano cheese soaked in syrah. Big veggie platter with various dips: spinach and kale greek yogurt dip and white bean and basil hummus. Other winners were, a crockpot of the frozen meatballs mixed with a bottle of their apple bourbon BBQ sauce, corn and chili salsa and chips, roasted and salted marcona almonds with rosemary, and a giant bowl of herbed popcorn. I use MANY other staples to feed myself and my toddler (husband isn't a TJ's fan - boo! ), but these have been my most successful and easy party wows. I cannot agree with you more about produce! The last time I bought avocados there I was so annoying. They were total crap! Cheese though -- yummmmmm. Pre sliced brie? Brilliant! You have to try TJ's frozen chicken gyoza (pot stickers). Throw those babies in some chicken broth with a bag of stir fry veggies and some sesame oil and you have yourself an awesome Asian inspired soup. We will often just eat the gyoza plain because they're so flavorful. We have them in our freezer at all times. I promise you'll love them! The Curry Simmer Sauce (in a jar) is excellent, I add an onion, can of diced tomatoes and chicken breast and serve over rice. Love the frozen croissants and Kougn Amann (sp?) They do this amazing rack of lamb chops too, in the frozen section - it's a little more expensive (around $12) but great for a special dinner. I go to TJ's once a week and haven't tried most of what's on your list. I'm definitely going to pick up these up! And for the produce, I've always gotten great produce at TJ's. In fact, its what I go for most there! Maybe it depends on the location? The frozen spinach and kale bites are a big toddler hit! A great way to get GREEN on the plate! My 2 favorite things.... the frozen mushroom ravioli in truffle sauce. But seriously - it says each bag is 3 servings? More like 1 serving per bag. And the peach salsa. I don't like peach.... and I don't like salsa... but the peach salsa is YUM! This was an awesome list. I love TJ"s. I really like the Lemon Olive Oil. Another blogger YEARS ago told me about the frozen turkey bolognese (IT IS AWESOME). I pop it in the microwave and serve it to the kids over pasta and sometimes with mini meatballs. When I have a group of people I combine the bolognese with a jar of the Puttanesco (sp?) sauce and a jar of the Arrabicca (sp?) sauce in a big pot. I serve that with pasta (non-TJ's) and the Fresh Parmsean shaves from Tj's. I get TONS of compliments. We also like the frozen french onion soup, the flowers & potted herbs, and TJ's brand of sparkling - flavored waters. Could not agree with you more about the produce! You're so right about the cheeses too!! So delicious and WAY cheaper than any where else! !